This campaign takes place 500 years before the events of Xenoblade Chronicles 2 on an ancient titan, Torna. It’s a land threatened by war but largely indifferent to the idea of fighting. 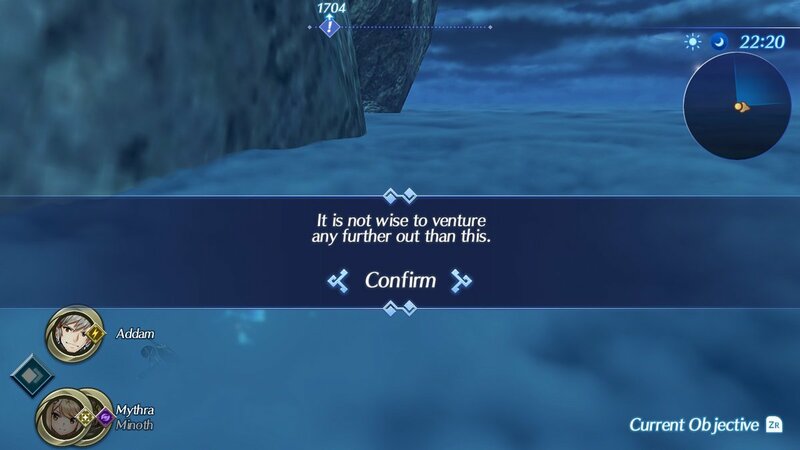 A lot was happening across Alrest, but Torna was focused on its own spiritual growth. Everyone got along with each other as builders, artists and chefs all shared their works out in the open and tried to enjoy their day. Times were simpler, gacha systems hadn’t been invented, and Drivers and Blades met in person. It is a smaller game than Xenoblade Chronicles 2 but a more personal one. Let me put into context what “small” means though, in this case. It’s a “small” version of one of the biggest JRPGs ever made. 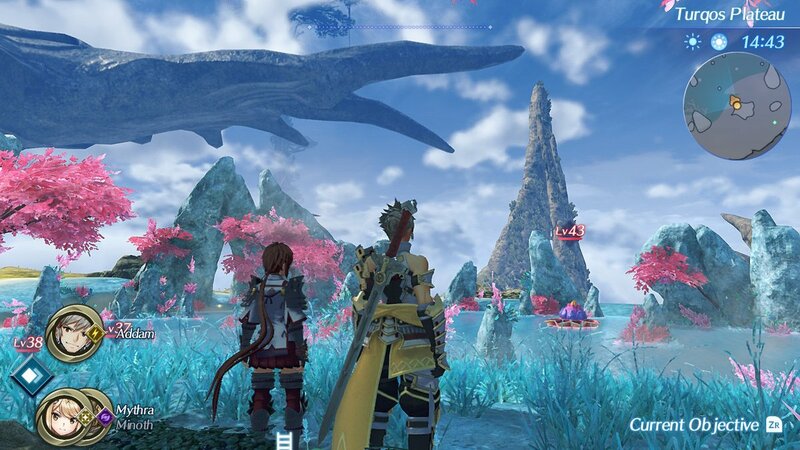 Torna’s story takes place on two gigantic titans with several fields and horizons beyond horizons. It’s only small compared to the scope of XC2 which takes place on five titans and has several population’s worth of stories intertwining. This is solely from the perspective of Torna at an important time in history. The scale of the events is just as big, and the feeling of purpose remains high. Auresco, the capital of Torna, is where a large amount of business takes place. The most interesting thing about the capital is not what you see immediately, but the way it changes. I became so attached to the city that every time a major story event happened, my first thought was to see what everyone was saying. What’s that, a super scary threat to fight somewhere? Nope, gotta chat to everyone first. There’s even a star above the speech box on someone if they have something new to say and the game actively encourages this social approach. This is all intentional design, as the story unfolds you get more attached to the land, the people and the game itself. It’s a feeling of immersion connected to a tangible world full of consequence, rather than audio and visual trickery that is often improperly described as “immersive”. Torna is full of heart, a huge strength of this game is the ability to experience events from so many different perspectives. I suppose that is a strength of videogames in general, compared to other mediums. The Xenoblade series in particular since the very first game has had vastly different populations, races, perspectives, and even languages. 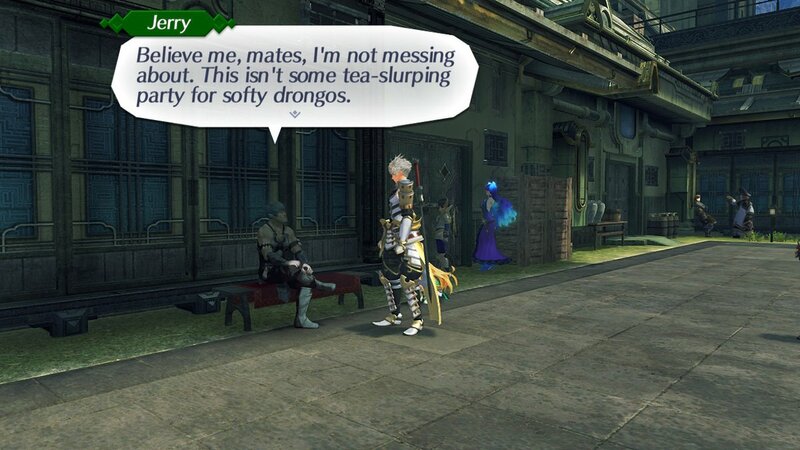 In Torna you don’t even have to seek out the story half the time. People will wish you good luck in a passive speech bubble as you walk past. They gossip and say things like “I can’t believe Addam and crew took down those monsters outside of town!” and you really feel like you made an impact when you did that quest. It’s so nice seeing people in town happy when the overall threat in this game is so daunting. Light shines brightest in the darkest places. Alongside the Quest log is a new tab in the menu called Community. Quests are linked to this, but you can also gain community support just by talking to people in some cases. It adds weight to the game in two different ways. Firstly it makes it feel like everything is worth doing, because you’re rewarded with personal dialogue and things changing and progressing in town with an overall “Community” number accumulating. Secondly it adds to the gameplay depth. 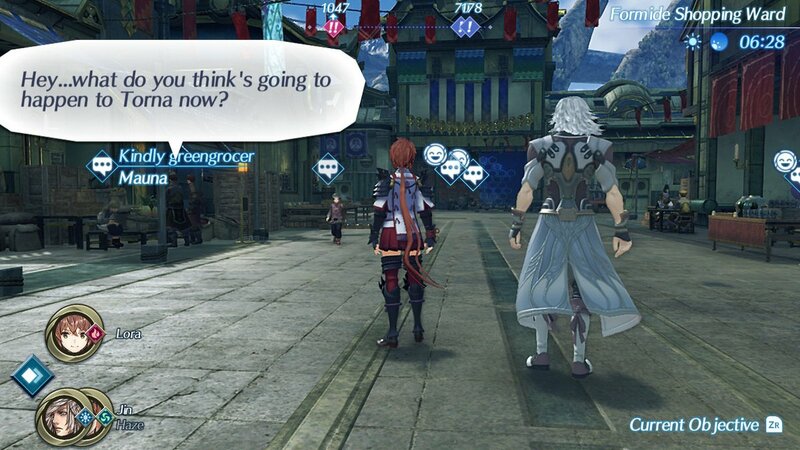 While walking through the Torna countryside you might just be doing a single quest, but you’ll pass an enemy that somebody else wants defeated, or find an item belonging to someone else in town. Then on the way back you might find some materials to craft a new item with. Speaking of crafting, it’s time to settle in for the night. Campfires are spread out through the country as a way to regroup, level up, craft items and chat. Yes, chatting is an optional feature and it is nice. In case you get lost in sidequests, it serves the purpose of reminding you where the main story is at, with everyone’s thoughts and feelings on the current matter at hand. 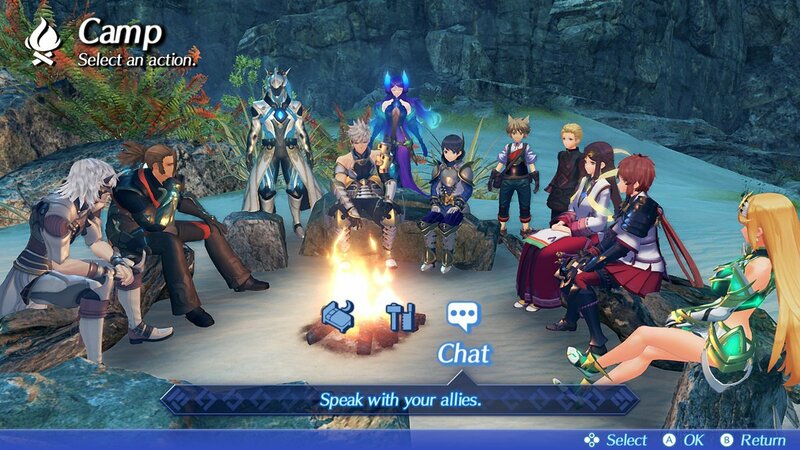 It’s a nice personal touch to sit at a fire instead of go to an Inn, and another thing that separates this campaign from the bigger Xenoblade entries. You can also craft different items with each of the people in your crew, or rest to redeem your bonus experience points that get saved up by doing quests. Exploring the country in this game has such an organic feeling, as it feels like there’s always a reason to be out there. Not just for the numerous quests and treasures, but the beautiful landscapes. I don’t think RPGs have ever had worlds this rich and beautiful. With that polished Nintendo control, it feels like simply running through the terrain and rotating the camera is gameplay in itself. Just listening to the music and watching the creatures movement patterns is enjoyable. Even the land itself is moving, as the titan’s wings gently flap in the distance. The world is breathing. The new music is outstanding. I’ve had the main field song stuck in my head ever since I first heard it, it’s just so perfect and soulful. It has a slow-build and complexity that makes it great background music, while also hitting the feelspots with some long sax notes that make you stop in your tracks completely. The battle music also carries this new jazzy vibe which makes battles feel more fun and less grindy. I believe the Torna campaign has 11 new songs, and with the original game having well over 100 that might seem small. However they are all extremely high quality and the 7 minute daytime field theme is an absolute masterpiece. Some people have the wrong impression of Xenoblade, with the idea of some perky anime happy-fun-time nonsense series full of fan-service and cheap thrills. There’s nothing wrong with that, but it couldn’t be further from the truth. The game is very serious and consistent with human expression and vulnerability, and it achieves this with extremely high quality writing and layers of story building. The way people act and react to things is realistic, with relatable dreams and approaches. There’s nothing too “unreal” about it besides the visual designs and the world itself. Even that, in my opinion, has some very interesting ecology but that’s for another discussion. I feel like this is a game series anyone can relate to and the exaggerated designs are just a way of making things more colourful and expressive. This is a huge strength of videogames, to create designs we don’t see every day and challenge our way of thinking. I still think about that one soldier in the original Xenoblade with 9 kids who can’t leave his post. If you saw his basic grunt design without playing the game you would not think about that at all. Once you start playing, the game world is very welcoming, approachable, and warm. Torna as a DLC package is somewhat unique, as it provides not just “extra content”, but a potentially good starting point for the Xenoblade series if you’ve never played any. Maybe someone put off by the huge length of traditional JRPGs can find a better starting point with Torna’s 30 hour campaign (my personal story time, 50+ hours for sidequests). This is a rare occasion where NOT playing Xenoblade 2 could actually make the story more enjoyable too, because then you won’t know the future in the game in advance. I had some mixed feelings towards that, but it’s still amazing whether you’ve played XC2 or not. It’s nice to see some different versions of locations and different perspectives, so either way you’re going to get something interesting out of it. To wrap this up I will conclude that Torna is a fantastic addition to one of the best series in gaming right now. It adds some significant story to Xenoblade Chronicles 2, while also existing as a new game in itself. Creating DLC is a task that was not taken lightly by developers Monolith Soft. It really feels like they are at their creative peak right now, and they have made something really special here. Torna features brand new music, new environments, and doesn’t just bring a brand new story but a whole new personality. It doesn’t come close to vanilla XC2 in terms of content but still provides a new experience worth checking out. I love everything about it and just had to share my thoughts. Now if you’ll excuse me I have somewhere to be. This entry was posted in Uncategorized and tagged Nintendo Switch, Torna: The Golden Country, Xenoblade. Bookmark the permalink.